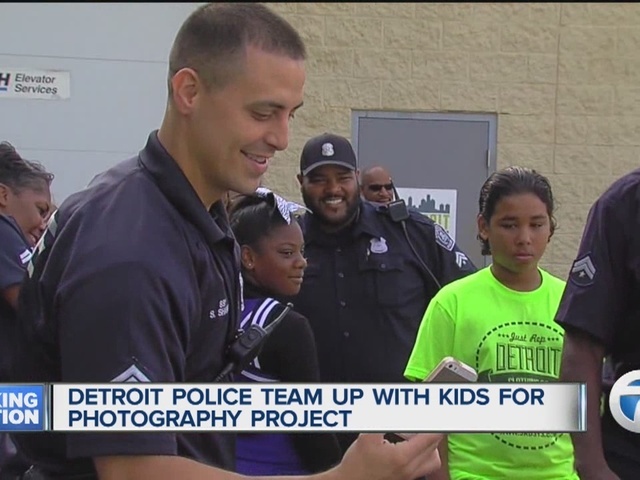 Police officers are helping to create wonderful photographic memories for kids in Detroit’s Police Athletic League with the help of an award winning photojournalist. The program is called Pictures of Hope and it’s all about reaching for dreams. “Get homeless people from off the streets, more police officers and no more houses getting set on fire,” are the noble dreams of Deonte Sparks. He is among several Detroit youngsters spending their Saturday with cops and cameras. The program, hosted by the Detroit Police Athletic League, is facilitated by photojournalist and Motor City native Linda Solomon who shared tips with the young shutterbugs. They also are building the foundations of healthy, productive relationships between the kids and the officers. Perkins and Sparks were paired together and connected with each other surprisingly well. “He’s a really nice guy!” exclaimed Sparks. “I was amazed and shocked to find out we actually have so much in common,” said Perkins. “He likes to play basketball, just like me,” said Sparks. “We (have) the same favorite color, blue,” he continued. “He likes math and I have a degree in math,” added Perkins. The special bond between the two new friends was very evident. “They’re sharing their hearts and showing how much they care,” said Solomon. “The relationship they build is really phenomenal,” said Tim Richey, chief executive officer of Detroit PAL. “It’s something that’s not only for today but it’s something that’s going to last with them for a while,” he added saying the officers and children end up with new respect for each other. After bonding through ice breaker sessions and learning a few basic techniques from the pro, the children received a big surprise from Solomon— their own digital cameras, which they get to keep. With hopes and dreams at heart and new cameras in hand, it was time to snap away. Some eagerly started taking photos in the classroom. Others waited until they went out into the city. The officers and children jumped into three vans and fanned out to various locations including Hart Plaza and Belle Isle. Each of the participants will have one of their photos featured on special greeting cards which will be unveiled in November at a special event to be held at the Charles H. Wright Museum of African American History. The cards will be sold with all of the proceeds benefitting Detroit PAL.